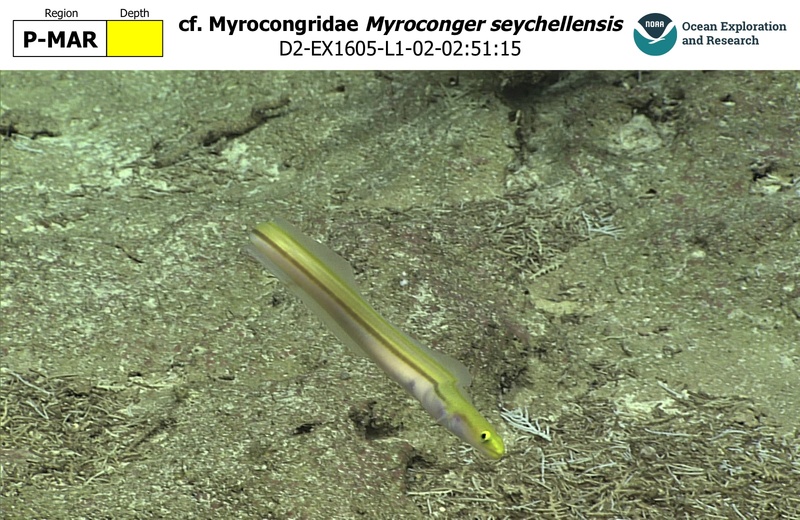 Conger-morays are a weird little family (Myrocongridae: Myroconger) that few have ever heard of and fewer still have had the good fortune to see alive. The handful of species in this group are of considerable interest to taxonomists, but, for anyone else, these eels stand out most for their extraordinary colors. Compared to their drab cousins, the moray eels (Muraenidae), the conger-morays dazzle in shades of orange and yellow, often with contrasting stripes that lend a dramatic flair. After more than a century of uncertainty, these two families are now known to be each other’s closest living relatives, and, at first glance, it might not be apparent how they differ from one another. The most important morphological trait to look out for is the presence of a pectoral fin in Myroconger—true morays lack these. Pectoral fins can also be found in other eel families, most prominently in the distantly related Conger Eels, and, combined with the otherwise muraenid-like skeleton, this is where the common name for the group originates. Also of note, conger-morays possess a longer series of lateral line pores (5-7 vs. 1-2 in muraenids) and a larger gill opening, as well as a variety of skeletal distinctions in the bones of the gill arches, jaws and skull. Most notably, the weird pharyngeal jaws common to true morays are absent here. When ichthyologist David Smith reviewed Myroconger in 1984, just two specimens from a single species, M. compressus, had ever been collected! 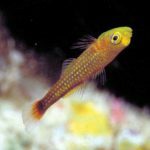 In the years since, an additional four species have been described from the Indo-Pacific, while another specimen suspected to represent an undescribed species was recently collected in Brazilian waters, but the group remains uncommon and seldom seen. 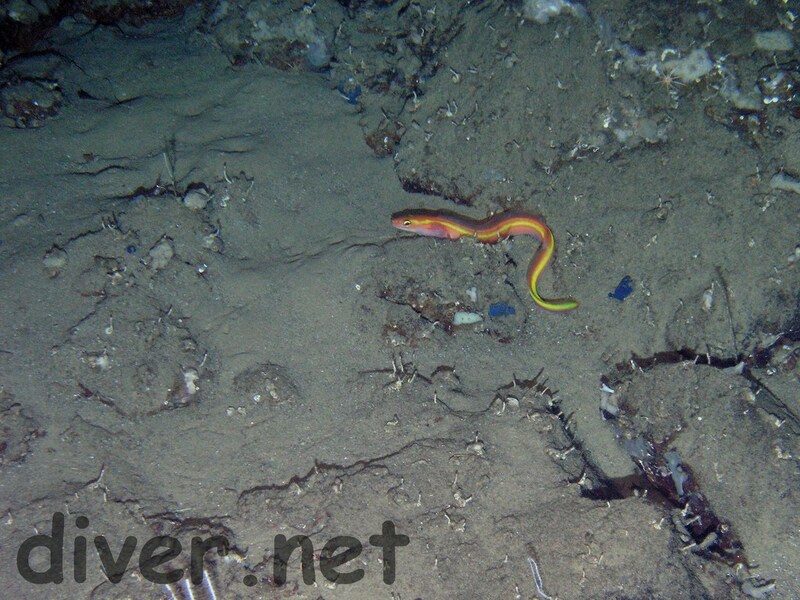 Their apparent rarity stems from a preference for lurking within the crevices of rocky substrates at rariphotic depths, with most reported from 200-300+ meters deep. This is challenging habitat to sample from, so most have either been caught by fishermen or were observed in situ by submersibles. The Orange Conger-moray (M. nigrodentatus) seen here was photographed by diver Chris Grossman at Cocos Island (roughly midway between Costa Rica and the Galapagos Islands) during a dive to 300 meters. This was aboard the Undersea Hunter’s DeepSee submersible, which means that you, dear reader, can buy a ticket and potentially see this gorgeous conger-moray for yourself. Aside from its lovely colors, not much else is known about the species. The type specimen was found in an Ecuadorian fish market, and the only other record comes from the Galapagos. In all likelihood, this eel can be expected to occur more broadly in the tropical and subtropical Eastern Pacific Ocean; the undescribed Brazilian Myroconger is said to bear a close resemblance. Some of its congeners are equally fetching. 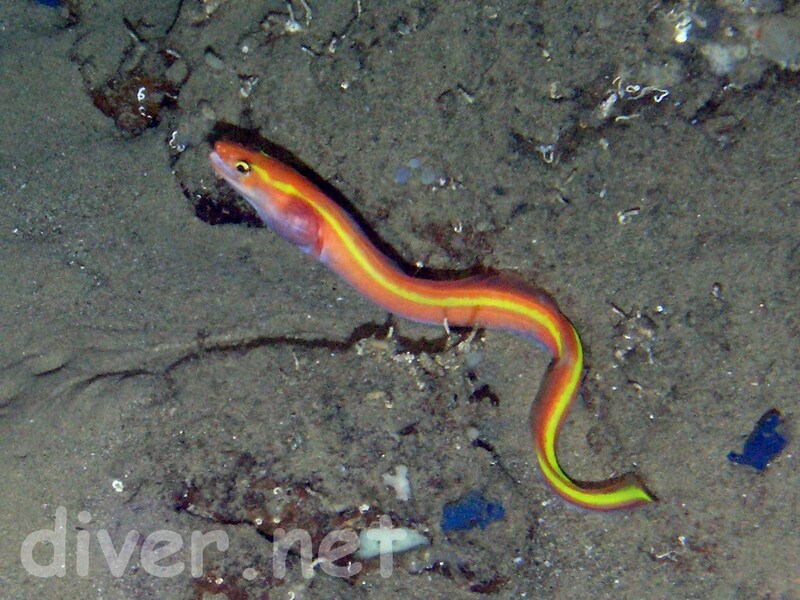 The Red Eel (M. compressa) is known from scattered locations in the Central and Eastern Atlantic, and is, as the name suggests, bright red. 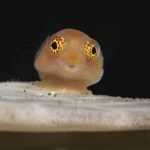 And last year’s Okeanos Explorer dives in the Central Pacific revealed a gorgeous specimen at 280 meters which matches up to the description of M. seychellensis, originally known only from a fish trap in the Western Indian Ocean. Karmovskaya, E.S., 2006. New species of the genus Myroconger, M. seychellensis (Myrocongridae, Anguilliformes) from the western equatorial part of the Indian Ocean. Journal of Ichthyology, 46(8), pp.563-565. Castle, P.H.J. and Bearez, P., 1995. Two new species of Myroconger (Anguilliformes, Myrocongridae) from the Pacific Ocean. Cybium, 19(3), pp.211-222. de Paiva, C.C., de Araújo, M.E., Caires, R.A., Salles, R., de Medeiros, R.S. and da Cruz Lotufo, T.M., 2011. 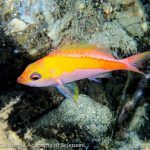 Six new records of deep-sea fish off north-eastern Brazil. 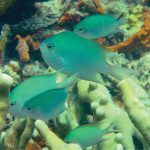 Marine Biodiversity Records, 4. Smith, D.G., 1984. A redescription of the rare eel Myroconger compressus (Pisces: Myrocongridae), with notes on its osteology, relationships and distribution. Copeia, pp.585-594. Tang, K.L. and Fielitz, C., 2013. Phylogeny of moray eels (Anguilliformes: Muraenidae), with a revised classification of true eels (Teleostei: Elopomorpha: Anguilliformes). Mitochondrial DNA, 24(1), pp.55-66.